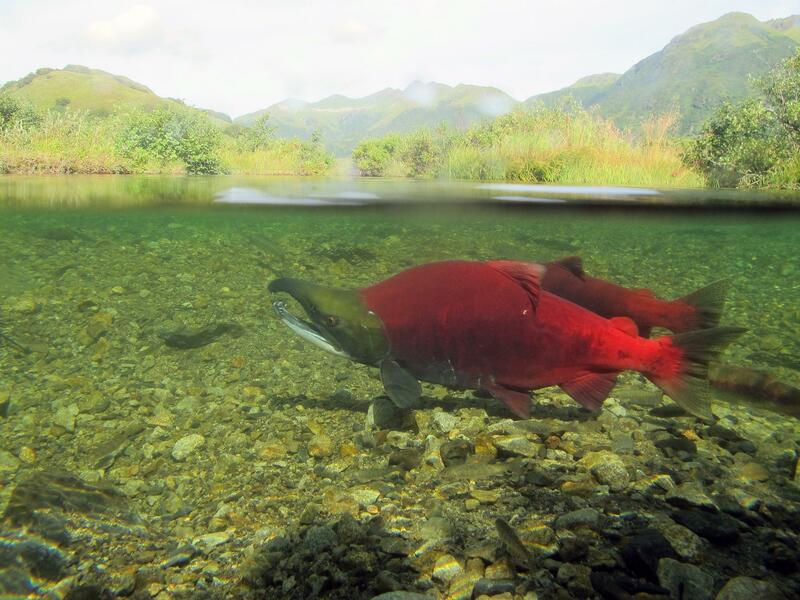 As salmon stir up sediment to build redds, they can cause erosion nearby and downstream. Over millennia, that erosion could make some landscapes up to a third shorter than they would be otherwise. When salmon spawn, the females build nests or redds by turning onto their sides and flapping their tales to stir up sediment. That can expose the riverbed and lead to erosion nearby and downstream. Such erosion is a well-studied phenomenon, but what is the effect over millennia? A study recently published in the journal Geomorphology found that over time, salmon may play a significant role in sculpting landscape surrounding the rivers where they spawn. The team of researchers conducted the study by creating a computer model to simulate chinook, sockeye and pink salmon’s spawning activities. The model showed that land and mountains around rivers where salmon spawn could be nearly a third taller if salmon were not present. “We figured that there would be an effect, but, to be honest, I thought it would be rather small, maybe a few percent,” said study co-author Brian Yanites, an assistant professor in the Department of Earth and Atmospheric Sciences at Indiana University. The crux of the study for Yanites, is the way it demonstrates the interconnectedness of scientific disciplines. “We often think of geologists working on the rock and the mountain ranges, and the biologists are over working on their fish. But really the biology and the earth interact over these long time scales. If one thing changes in the biologic system or geologic system, it can propagate through a bunch of different earth system,” said Yanites. The next step for scientists is to apply their computer model to the physical world. “What we’re thinking about now is, can we see the actual impacts in a real landscape and be able to attribute that [to salmon]?” said Yanites. So far the model is a theoretical one, it has not been applied to specific river systems in Alaska or elsewhere. But it does suggest that the salmon that have shaped culture and history in Alaska for generation upon generation have shaped some of its landscapes and mountains as well.